Working as singing waiters, the Three Stooges are enlisted by a doctor to try and cheer up a little girl. Her father, a banker, was kidnapped with $300,000 worth of bonds. Failing to cheer the girl, the Stooges decide to look for the father and wind up in the bad guysâ hideout. The villains return and, after a wild fight, the boys free the missing man. 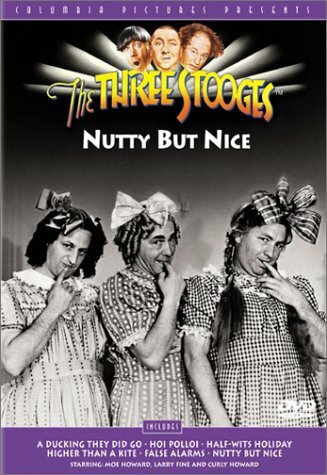 Nutty But Nice is frankly one of my very favorite Three Stooges short film, if not my personal favorite. It combines my favorite elements of the Three Stooges: The Stooges showing their good nature to help someone in need, their verbal and slapstick comedy, their frenetic fast-paced comedy, etc. Nutty But Nice begins with the Three Stooges (Moe, Larry and Curly) working as singing comedy waiters in a restaurant – they wait on two regular customers, both doctors. One of them is played by Three Stooges regular Vernon Dent, who suggests to his colleague that the Three Stooges might be exactly what they need to help one of their patients – a little girl. Her father, a bank employee, has been kidnapped by gangsters along with 300,000 dollars worth of bonds, and the little girl is depressed. The Three Stooges dress up as little girls, and visit her in the hospital, trying to cheer her up with a short slapstick routine. It’s very funny, but nothing will make the little girl better but the return of her father. So the Three Stooges volunteer to find him, and off they go! The search for the little girl’s father is one of the funniest parts of the film, as Curly yodels (listening for the man’s yodeling reply), and Moe and Larry use the other clues to look for the man. Since he has an anchor tattooed on his shoulder, they rip the sleeves off strangers’ shirt. And since he’s five feet ten inches tall in his stocking feet, the measure random men on the street – taking their shoes off by force. There’s a very funny running gag as they keep running over a man leaving a tavern carrying buckets of beer (yes, that’s how people could actually purchase beer back in 1940), using the Rule of Three to repeat the joke only three times, ending with the frustrated man stamping on his pails, only to have a disheveled police detective (who the Stooges have attacked and stolen his shoes from) arrest him for public intoxication! Despite their utterly inept attempts at tracking down the man, they actually succeed when Curly hears an “answering yodel” from the radio that the gangster’s turned on. After an upstairs neighbor drops a potted plant or two on Curly’s yodeling, they make their way to the gangster’s apartment, overpower him and rescue the girl’s father and his bonds. It’s a very funny scene as they unintentionally keep hitting that poor gangster into unconsciousness. Soon, the other members of the gang return, and they try to escape via the room’s dumbwaiter, but make the mistake of sending Curly down first, ruining the dumbwaiter and having Moe and Larry drop down the shaft, landing on Moe and the banker. Soon they’re trying to make their way in the darkened basement, with several laugh-out-loud moments, such as Curly unscrewing a lit light bulb — that stays lit. Eventually the gang tracks them down, and after another wild fight, the Three Stooges stand triumphant, and the film ends with the doctors, banker and the little girl at the Stooges’ restaurant, as Moe, Larry and Curly sing a silly song about their deserts, ending with Curly wanting custard on his pie – and Moe and Larry comply, hitting him with pies. Nutty But Nice is a personal favorite Three Stooges short film, and I hope that you enjoy it as well. It’s available on DVD as part of The Three Stooges Collection volume 3. Be sure to enjoy their verbal comedy in the funny movie quotes from Nutty But Nice as well. Nutty but Nice (1940, number 47) has the boys trying to help a melancholic girl by finding her kidnapped father. It starts interestingly with the boys as a team running a musical restaurant, but it turns to more familiar material as they try to escape from an apartment using the dumbwaiter. (They will never learn not to send Curly down first.) What makes this entry more interesting is that Vernon Dent gets to play a straight, sympathetic part that calls upon him actually to laugh at the Stooges’ routines. The title Nutty but Nice is a play on the old expression, “naughty but nice”. Curly was first called “Swiss Cheese” in this episode.